One Direction commonly known as 1D is an English-Irish pop boy band based in London announced their 2015 tour on TV. This famous band consists of 5 good-looking young men named Niall Horan 21, Zayn Malik 21, Liam Payne 21, Harry Stayles 20 and Louis Tomlison 24. They first entered as an individual entrant in the popular singing competition on TV: The X Factor. They captured a lot of awards including the two BRIT Awards, three NME awards, two Kid’s choice Awards, four MTV Video Music Awards, nine Teen Choice Awards, two American Music Awards. Their record breaking studio albums and numbers of hit tours assisted them to their epitome of success and popularity. Their path to success is quite linear and still soaring high. The Today Show, a daily American morning television show that airs on NBC (National Broadcasting Company) witnessed the announcement of the tour in their privileged pre-recorded interview. They mentioned about their tour dates which came out that they would be visiting Philippines on May 21, 2015 in their second leg. “On the Road Tour Again” has been speculated to bring multitude of people on the road to one direction: Mall of Asia, where the concert will be held. They are so back in spotlight to entertain the Filipino people. Tickets run out and sold out easily on market. 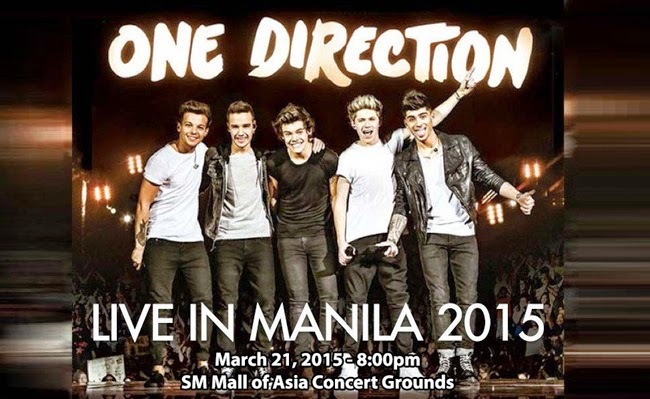 The “On the road again tour” will be starting its first leg in Australia on Feb. 7 to 20, 2015, second in Asia on Feb 24 to Mar 25, third leg inAfrica n Mar 28 to April. The Last leg will be in Dubai on April 4. Fans all around the world will experience superb excitement to be with their favorite boy band. So if a fan is missing out something here, better save for something beautiful like this. This is a one golden chance to mingle with those pretty boys. The boys otherwise are far more excited to be with the Filipinos. For those who are avid fan and dying to see them live on concert, these are the ticket prices: VIP/Hot Ticket Package P17, 000; Diamond P14,000; Titanium P7,000; Gold P3,500; Silver P2,000; General Admission P1,000. Additional E-pass and SM Ticket charges apply. VIP/Hot Ticket Package is also in its way to make the concert even memorable than expected by adding 1D wristwatch with pouch, a laminated card and lanyard. Tickets are available in all SM ticket outlets. So what are you waiting for? Time is ticking. Grab one now and be lucky to be with them face to face because that’s WHAT MAKES YOU BEAUTIFUL.